Look to the future of on-hill slope style with Roxy’s range of women’s ski goggles. Giving you unparalleled vision with the finest lens technology and ergonomic design, our ski goggles help make white outs and wipe outs a thing of the past. Designed by the best in the business for the adventure ready wilderness explorer, our range of snowboard goggles are built for beating the elements, blending fashion forward aesthetics with cutting edge innovation and unparalleled optical clarity. 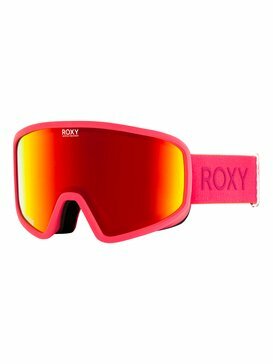 Harnessing a strong no-nonsense attitude to your alpine essentials, Roxy skiing goggles and womens snowboard goggles offer the very best tech rich products and playful practicality. A creative mix n’ match of quality materials and contemporary design, each winter season is a new exploration into the unknown - facing the challenges of action sports innovation head on. 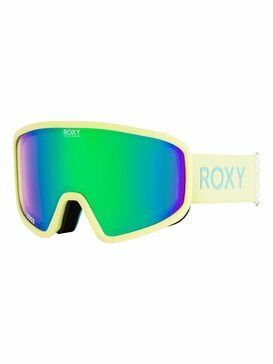 A creative marriage of on-trend colours, styles and materials, Roxy polarized ski goggles are a dynamic and chic interpretation of endurance lead design. Since the start, Roxy has been committed to improving the fit, feel and function of all of its female empowered products. From next generation frameless ski goggles to après ski ready ski sunglasses, all of our reflective ski goggles come with ergonomic comfort fit design, soft-touch padding and fog-free features that reduce glare and steamy lenses in any condition. Designing female-focused outerwear and accessories for the fun and free-willed mountain maverick, Roxy ski goggles are more than meets the eye. Collaborating with an original cross section of industry insiders, fashion vanguards and geek chic girls in the know, we unite every season to brain storm on the best way to give you the very finest snowboard tech with an authentic flair! Designed for pro-athletes and altitude aficionados alike, we build badass accessories for tearing it up in the tree line and beyond. Showcasing a mood board of beautiful pastels and eye-catching colour clash combos, our snowboarding sunglasses and goggles aren’t one winter wonders, they’re built for all season riding in every condition Mother Nature can throw your way. Stress tested by some of the world’s most discerning riders, each pair of women’s ski goggles comes pro-approved with handy features that mean they can be clipped into protection and matched with our curated outerwear collections. Support your local girl gang and get in on the action over at Roxy. Giving you more than just a web store, we offer an online hub where girls like you can chase the snow line with the latest industry info, rider profiles and style news straight from the Roxy pro team! Celebrating individuality, we offer a large selection of snowboarding accessories and outerwear online for you to choose from. From white ski goggles to pretty pink ski goggles – we’ve got you covered! Showcasing the latest designs straight from our design floor to your door, you can pick up your kit for less with exclusive deals, discounts and super fast shipping available for all of our Roxy girls.